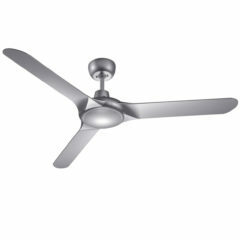 View cart “Lifestyle Ceiling Fan by Martec – Brushed Aluminium 52″” has been added to your cart. The Urban 2 ceiling fan with Light by Fanco is a modern fan with a popular shape featuring clean, simple lines and comes in a simple brushed aluminium finish. This fan also comes with a Light, which beautifully integrates into the design of the fan. Please note: This fan is suitable for raked ceilings however varies depending on the control method. If installed with a wall control it is suitable up to 24 degrees. With a remote control it is suitable up to 12 degrees. The Urban 2 ceiling fan by Fanco is a modern fan with a popular shape featuring clean, simple lines and comes in a modern brushed aluminium finish. It is quiet in operation with its solid plywood blades making it an ideal AC fan for bedroom use. The City ceiling fan features an energy saving DC motor with 3 plastic blades. 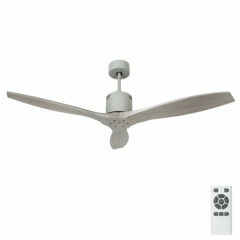 Its low profile design means this Mercator City ceiling fan a great option for those with lower ceiling heights. The DC motor means it offers 6 speeds and is operated by remote as standard. The Intercept Ceiling Fan has a 1320mm (52 inch) four blade sweep, Australian Design Die cast Aluminium housing with Timber painted blades. 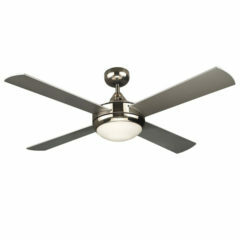 The Manly ceiling fan features an energy saving DC motor with 3 plastic blades. This Mercator Manly ceiling fan is a great option for the energy conscious and provides a modern fan option. The DC motor means it offers 6 speeds and is operated by remote as standard. The Primo ceiling fan is a quality fan from the reputable Four Seasons brand of Martec. This Primo features a brushed nickel body with silver painted timber blades and includes an integrated light kit that accommodates 2x globes. Please note: This fan is suitable for raked ceilings however varies depending on the control method. If installed with a wall control it is suitable up to 28 degrees. With a remote control it is suitable up to 12 degrees. The Galaxy II ceiling fan features a unique 3 blade design with an energy efficient DC motor utilising 5 speeds. It also has reversible settings for summer and winter use via the included remote control. This model has three solid timber blades with a silver wash colouring. The Typhoon ceiling fan by Hunter Pacific is a four bladed high quality fan which comes in various colours, materials and sizes. 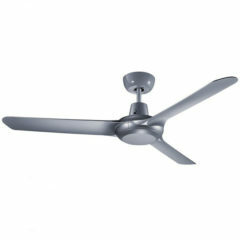 The Typhoon ceiling fan provides strong air movement in a modern design. This Typhoon ceiling fan has metal blades, and is finished in brushed chrome. It is available in 48″, 52″ and 56″ in the new Mach 3 model. This is an ideal ceiling fan for the home. 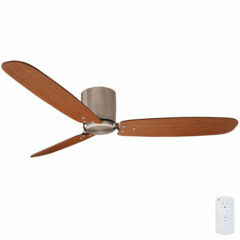 The Manly ceiling fan features an energy saving DC motor which offers 6 speeds and is operated by remote as standard. 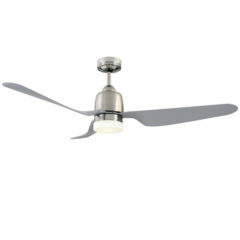 This Mercator Manly ceiling fan is a great option for the energy conscious with its 35w motor and 12w LED light. It is a modern designed 3 blade ceiling fan. 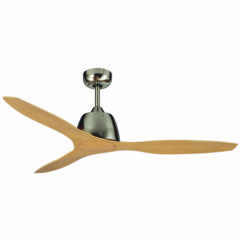 The Lima Ceiling Fan features a low wattage DC motor with three plywood blades. The blades span over 1320 mm (52″) in diameter. The fan comes with a 6 speed remote control. 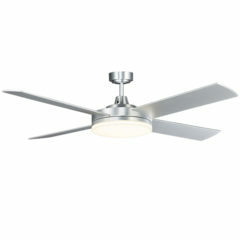 This Urban 2 ceiling fan with LED Light by Fanco is the newest edition to the Urban series. 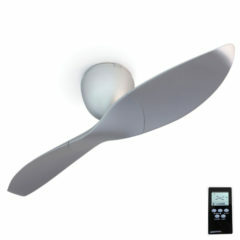 It is the same modern fan with a popular shape featuring clean, simple lines and now comes with an energy efficient LED. The Intercept Ceiling Fan has a 1320mm (52 inch) four blade sweep, Australian Design Die cast Aluminium housing with Timber painted blades. This model includes a 2X E27 Globe light. 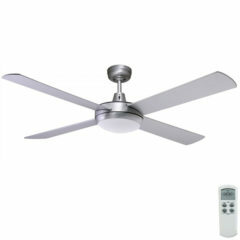 This Urban 2 ceiling fan with LED Light and remote by Fanco is the newest edition to the Urban series. It is the same modern fan with a popular shape featuring clean, simple lines and now comes with an energy efficient LED and remote control with dimming functionality. This fan has a brushed aluminium finish and silver blades (also available in white with white blades – listed separately). 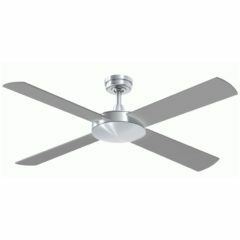 This listing is for a ceiling fan with LED light and remote package. 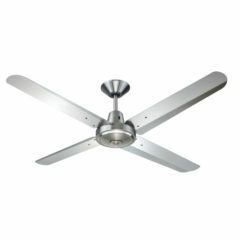 The Rhino is a large 95″ ceiling fan with 9 black metal blades and brushed chrome body. 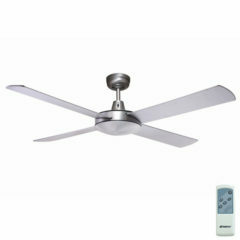 The fan comes with an Eco-friendly DC motor and reversible remote control. 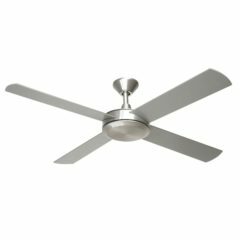 The Razor ceiling fan is a brand new fan from Martec and offers a slim motor design with powerful performance. The Razor offers timber blades and a 3 speed wall control as standard. This model includes a 28w cool 5000k (2050 lumen SMD) LED light. 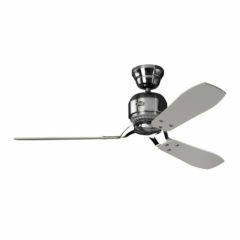 The Spyda is a powerful ceiling fan with a maximum motor wattage of 55 and 3 ABS plastic blades. The Spyda fan comes with a 3 speed wall control and is light adaptable. It has reversible airflow for cooling down in summer and keeping warm during winter. The Concept 2 Ceiling Fan has a 1320mm (52 inch) four blade sweep, Australian Design Die cast Aluminum housing with Timber painted blades. 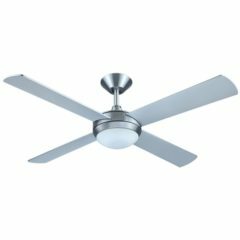 The Mercator Rosebery ceiling fan features 4 unique blades, is reversible for summer/winter use and comes complete with light and a 3 speed wall control. The Lifestyle ceiling fan with light by Martec is a modern fan with a popular design featuring clean, simple lines. This fan comes with a brushed aluminium finish. There are two light options. 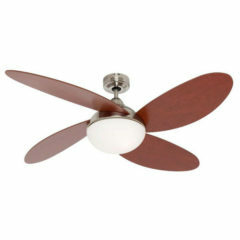 The Spyda ceiling fan is a powerful ceiling fan with a maximum motor wattage of 55 and 3 ABS plastic blades. The Spyda comes with a 3 speed wall control and is packaged with 1 x 20w LED light kit. It has reversible airflow for cooling down in summer and keeping warm during winter. Choose from either 3000k Warm White or 4200k Natural White. The light kit is dimmable via the wall control or with the remote control with the dimming function listed below as an accessory. The Urban 2 ceiling fan by Fanco is a modern fan with a popular shape featuring clean, simple lines and comes in a simple white finish. This fan also comes with a remote control. 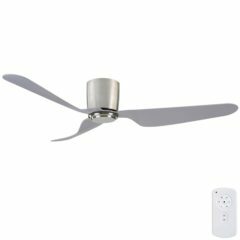 The 48″ Manzer II ceiling fan from Ventair is ideal for bedrooms and small living spaces with its 45W motor and 3 ABS moulded plastic blades. The Manzer II has excellent air circulation as it utilizes a premium long life motor and components with Ventairs True-Spin Technology. Comes with a three speed wall control and reverse functionality. This Martec Elite Ceiling Fan features a timeless and classic design with bamboo coloured blades and a brushed nickel motor. A great addition to compliment any living space, private bedroom or study the Elite Ceiling Fan has a powerful yet efficient 50W motor. It’s ABS plastic blades are electronically factory balanced ensuring a quiet and stable operation. The Elite fan comes complete with reverse functionality for summer and winter seasons and a 3 year in home warranty. Ceiling to base of motor drop is 350mm. This fan can be installed on ceilings with a raked ceiling up to 12degrees. 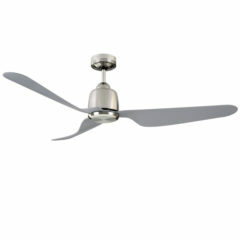 The Razor ceiling fan is a brand new fan from Martec and offers a slim motor design with powerful performance. The Razor offers timber blades and a 3 speed wall control as standard. This model includes a 28w warm 3000k (1845 lumen SMD) LED light. 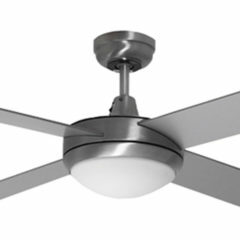 The Lifestyle ceiling fan by Martec is a modern fan with a popular design featuring clean, simple lines. This fan comes with a modern brushed aluminium finish. 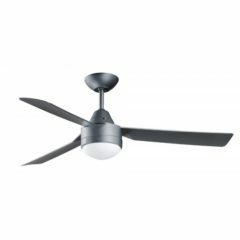 The Urban 2 ceiling fan with Dimmable LED Light and LCD Remote Control by Fanco is a modern fan with a popular shape featuring clean, simple lines and comes in a simple white finish. This fan also comes with a 2 X E27 dimmable LED Lights, which beautifully integrates into the design of the fan. The Urban 2 is packaged together with a dimmable LCD remote control giving you the flexibility of dimming the light via LCD remote control. 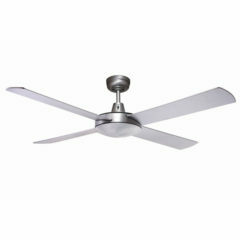 The 56″ Spyda is a powerful ceiling fan with a maximum motor wattage of 68W and 3 PC Composite (plastic) blades. It features high quality Japanese bearings, precision moulded PC Composite blades and True-Spin technology all to ensure balanced performance. It also incorporates an ECO switch setting, which requires pre-selecting a speed and allows the fan to run at a reduced operating cost whilst maintaining adequate airflow. The Spyda comes with a three speed wall control and is also reversible for Summer and Winter use. This Martec Lifestyle ceiling fan with 24w LED light is a high quality fan packaged with an energy efficient light option. With timber blades and reversible function for summer and winter, the Lifestyle is a great ceiling fan for bedrooms and living areas. Choose from Cool or Warm White LED light to be sent with the fan. 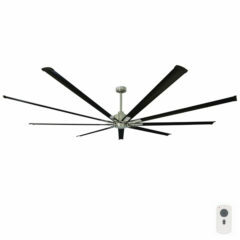 The Hunter Industrie II ceiling fan is a bold fan for a contemporary setting. This fan is light and remote control adaptable. The Industrie II has a Brushed Chrome motor and reversible timber blades with grey on one side and teak on the other (see images below), allowing you to personalise the fan to suit your area.